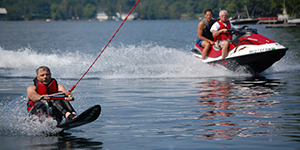 Whether this is your first time on the water or you are an experienced water sports enthusiast looking to hone your craft, EAS provides certified water ski instruction and the latest equipment. We strive to meet the needs from the beginner recreational skier up to those who wish to test their skills in a slalom course. The essence of adaptive waterskiing is that it allows an amazing experience for participants with a wide range of physical and/or intellectual disabilities. Reservations for lessons are available by calling or emailing geoff@easternadaptivesports.org. What better way to explore the beauty of our mountains and lakes than spending an afternoon cycling with Eastern Adaptive Sports. 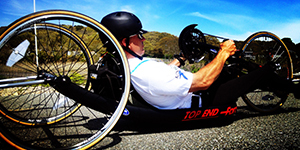 Not only will we fit you to the best bike for your needs, but we will also provide coaching and instruction to help our participants reach the best level of independence and personal goals. Cycling is the fastest growing sport in the adaptive community and allows individuals access to diverse recreational opportunities. From a beginning cyclist to the most competitive road warrior, EAS programming ranges from entry level rides to extended distance challenges and competition. Cycling is a sport for everyone and lasts a lifetime. 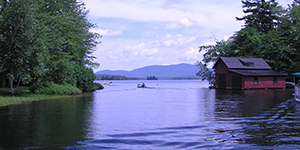 The Lakes Region of New Hampshire offers up some of the premier fishing within the water shed of Squam Lake. 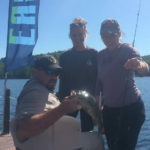 Eastern Adaptive Sports has many passionate and experienced local anglers willing to teach you and find those hidden holes that the lakes and streams have to offer. We have specialized vessels and barges for easy access to and from the water. Come with family and to enjoy the beauty and peace being on the water offers. Reservations are available by calling us at 339-788-5575.We can’t wait to see you on the water! WhThe beauty of skiing is that it can be done in so many amazing places here in New England, especially when partnering with the experienced adaptive ski schools located in the heart of our ski country. EAS has been fortunate to combine programs with the Spaulding Adaptive Ski Club. Spaulding Rehabilitation Hospital transports 15-20 adaptive athletes alongside family members, physical and occupational therapists, some of which are graduate students honing their craft and others are seasoned professionals sharing their wealth of knowledge. EAS pairs these athletes and therapists with PSIA and AASI certified instructors and volunteer coaches to individualize instruction and best utilize athletes’ strengths. 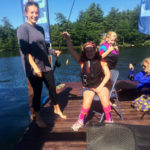 Adaptive ski schools include New England Disabled Sports, Waterville Adaptive Snowsports, Stowe Adaptive, and Vermont Adaptive Skiing.